The start of the 2016 Faxon Law Fairfield Half Marathon on Fairfield Beach Road in Fairfield, Conn. on Sunday, June 25, 2016. 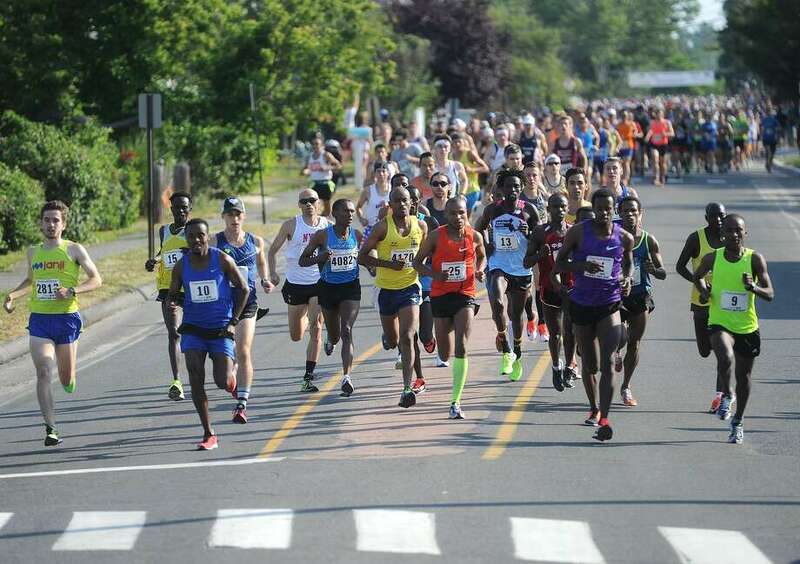 The Fairfield 5K road race and the Fairfield Half Marathon are scheduled to take place June 24 and 25, starting at Jennings Beach. Over 6,000 runners are expected to participate in the races with the half-marathon being recognized as one of the top 25 half marathons in the country. The Fairfield Road Races are a nonprofit organization that has contributed over $4 million to nonprofit groups. Last year’s race raised over $400,000 for charity. The course, which runs through Fairfield and Southport, offers participants views of stately mansions and picturesque beaches. The half marathon was recently recognized by Active.com, the world’s largest online registration service for running events, as one of the summer’s top destination road races. This year, the second Lucas Challenge will take place. Named after the Fairfield University Stag mascot, the Lucas Challenge encourages participants to compete in both the 5K and half marathon. The half marathon & 5K courses will feature more than 20 cheer groups and bands. Both courses offer numerous aid stations with water and UCAN electrolyte replacement fluid. Race amenities for half marathon runners include pre-and post-race sports massage, commemorative finisher medals and baggage claim. After each race, participants are invited to the post-race beach party featuring pizza, fruit, bagels, yogurt and live music. For more information, visit www.fairfieldhalf.org. The Fairfield Road Races are a unique community event. The event has a celebrated history of regional participation and broad-based community support. The races have gained national acclaim and a large international following. The half marathon (13.1 miles) and the 5K (3.1 miles) annually fields over 6,000 runners, bringing international stars from across the country. Several thousand volunteers and spectators line the course annually to support the runners. The Fairfield Firefighters have hosted the event from the start. The Fairfield Firefighters have stayed true to the mission of the Fairfield Road Races — to produce a national caliber sporting event and to donate the proceeds to local charities. In 1981, the half marathon began with just 200 runners. The race has also been a two-time host to the U.S. Women’s National Half Marathon Championship and three-time host to the National Masters’ Half Marathon Championship. The half marathon is routinely selected as one of the country’s top road races by Runner’s World Magazine. The 5K race was added in 1995 to encourage more casual runners to participate. The 5K has now become a popular family event and given its own day on the Saturday prior to the signature half marathon. For 2017, the 37th year, the race is again broadening its scope to include a half-mile Kids Fun Run to take place on the Saturday prior to the half marathon. The Fairfield Road Races receive tremendous positive exposure within the community. The success of the Fairfield Road Races is attributed to the generosity and commitment of all participants — runners, volunteers, community and civic organizations, particularly the financial and product sponsors.